The 7inova wireless powerline adapter kit provides a more flexible, strong, and stable wired & wifi internet connection to you and your family via powerline network technology. 1.Create a wifi hotspot(built-in wireless access point),works as a wifi bridge AP,extends wireless internet connection to hard-reach coverage with high speed up to 300mbps(N300), up to 7 wireless powerline extenders can be plugged in as a point to point add-on adapters. 2.Meanwhile,the available dual Ethernet ports work extraly as ethernet homeplug powerline bridge to access broadband network through wall outlet, maximum physical-layer data transfer rate is 500mbps(AV500). ● Powerline function has to be fulfilled with at least two pcs and make sure all the plugs are in the same circuit,when 7WHP530 works alone, it is a wireless AP as a bridge. ● To extend wireless to farther area, you can add-on more 7WHP530 single wireless powerline extender where you need, it will auto- pair and syn with the 7WHP530K powerline kit. We ensure every unit is made with premium materials and the most advanced technology.All our powerline adopts Qualcomm chipset,newest homeplug standard,ensuring stability, speed, security and performance. For peace of mind, Every Unit is back up with hassel-free refund and return policy if you are not satisfied. 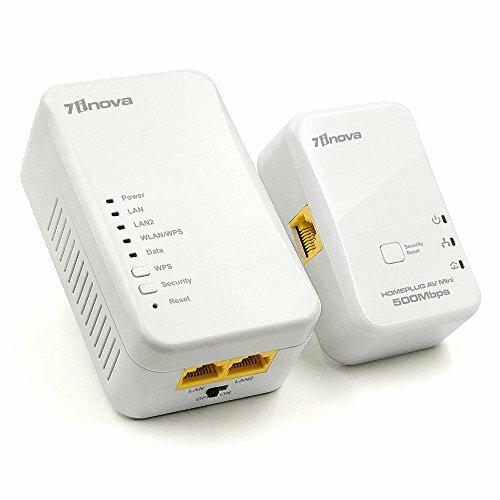 Ethernet Over Powerline (EOP) with built in wifi extender: Through (Powerline Technology) mains networking,7inova powerline adapter with wifi uses electrical wiring to add powerline access point in your home,extends wireless range access to every hard-reach point,with higher speed, stability and flexibility than traditional wifi booster/repeaters. Please be noted it does NOT support gigabit and 5Ghz spec. Plug Into the mains &Play in a blink of eye: Easy setup,plug the 7inova powerline wireless extender kit into wall power outlet,connect 7HP150 nano ethernet plug to router via lan cable,the 7WHP530 powerline bridge will auto-pair and ready for broadband extending. Please ensure the powerline kit is connected on the same electrical circuit. High Speed Powerline&Power Saving: Over power outlet, 7inova wireless powerline extender kit provide broadband fast wired speed up to 500mbps(AV500) and also wireless speed up to 300Mbps, 2.4G (N300) for internet connection,online gaming,TV ect; Power Saving Mode and switch to reduce power consumption; Support OS Windows 2000/XP/2003/Vista, Windows 7/8/8.1/10, Mac, Linux ect. Two Ethernet Ports Available: Besides act as a powerline adapter with wifi access point,the 7WHP530 internet lan adapter also provides two ethernet ports for IPTV. Gaming, Blueray, PC and large-free data, HD video streaming. Special Limit Time Promotion Price For Newly Restock: You will get a 7inova 7HP150 ethernet powerline av network adapter, 7WHP530 powerline wireless network extender, two ethernet cables, CD driver for private network name setup, user guide,friendly customer service and for a peace of mind:You will get return if you are not satisfied. If you have any questions about this product by 7INOVA, contact us by completing and submitting the form below. If you are looking for a specif part number, please include it with your message.